Chitrangada Singh and Jyoti Randhawa's divorce finalised ? Popular Bollywood actress Chitrangada Singh is divorced . 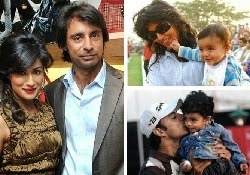 She was the wife of golfer Jyoti Randhawa .There were also news last year that the couple had filed for a mutual consent divorce after they were spotted at Gurgaon court but the couple denied by saying that it's a rumor. Now Latest News rounding is that couple had indeed applied for divorced last year, and court has put the seal on the sepration. They have a son Zorawar whose custody has been granted to Chitrangada. The couple tied the knot in 2001.Themordel-turned-actress made a successful debut in Bollywood with Sudhit Mishra's critically acclaimed film Hazaaron Khwaishen Aisi in 2003.Shetook break from acting from 2005-2008. After that, In 2008 she made her come back with a leading role with Sanjay Suri in Romantic-comedy Sorry Bhai directed by Onir. Media saying that problem grown up when Chitrangada settled in Mumbai to follow her acting career while Jyoti stayed onin Delhi. The couple have yet to confirm about thier divorce. Ye to hona hi tha beedu!! Afterol, In Bollywood or Hollywood this is not new thing.